The Beacon resembled a scene from a Christmas card as Jack and Jill and the snow topped South Downs looked down upon Hassocks' meeting with Horsham YMCA. And the seasonal scenes more reminiscent of December than mid-March almost inspired a miracle more magical than anything Christmas has thrown up down the years as the Robins came close to taking something from the Southern Combination League Premier Division's leaders. YM only made sure of their 20th win of the campaign when Ashley Dugdale added their second goal five minutes from time to secure a 2-0 victory which leaves them six points clear at the top with 10 nine games remaining. 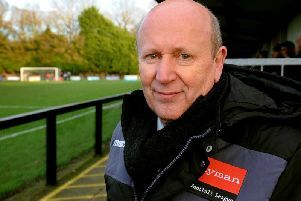 "If you were an outsider with no knowledge of the league table, you wouldn't have known there were 18 places between us today," said Hassocks joint-boss Phil Wickwar. "The young players are doing us proud and when I say young, I'm not talking 23, 24 or 25 year olds but 17-21 year olds who have played their youth football here with us as well." "The short term future in terms of our league position looks challenging but the long term picture looks bright when these young lads, most of whom don't have even half a season of senior football behind them, are giving the divisions leaders a real fright." There were eight youth team products on show for Hassocks and it was the oldest of those who was culpable for Ym taking the lead on the 15 minute mark, Spencer Slaughter being caught in possession by Tony Garrord who went in one-on-one to score his first goal for YM since arriving from Burgess Hill Town. The Robins moved the ball around well without ever really testing Aaron Jeal for the remainder of the first half while at the other end Haig Kingston also had a much quieter afternoon than he probably would've expected as Dave Brown, Dean Carden and Dugdale all failed to test the Hassocks number one. Hassocks looked the livelier side in the second half as Matt Berridge and Joe Russell played their part in a fine move through the middle of the park which ended with Connor Bradley opting to try and find Jack Wilkins with a pass when a shot on goal looked the better option. Bradley made way for Jake Atherton shortly after and Atherton should've been played in but the pass went the wrong way as again Hassocks' decision making when it came to the final ball continued to let them down. The best chance of the half from a Hassocks point of view came when a brilliant Jake Lindsey cross was met by the head of Michael Death who saw his effort somehow kept out on the line by former Hassocks favourite Phil Johnson while Johnson himself had a header go close when he sent the ball from a Brown corner the wrong side of the post. It was against the wrong of play somewhat when YM captain Dugdale made it 2-0 in the closing stages, side footing home from 10 yards to spark wild celebrations which showed that it was somewhat of a relief for YM to escape the snow covered Beacon with all three points. Hassocks: Kingston; Broomfield, Slaughter, Badger, Russell; Berridge, Mills, Bradley, Lindsey; Galbraith-Gibbons, Death. Subs: Wilkins, Atherton (used), Wickwar (unused).